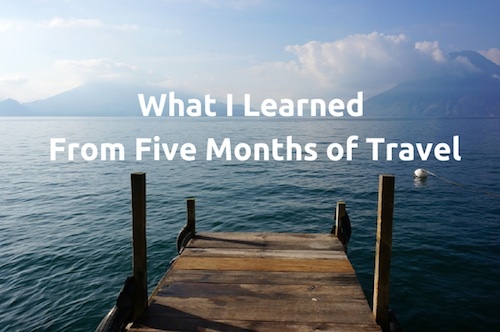 Five months of extended, slow travel taught me valuable life lessons that I never could have learned from a one week vacation or a weekend getaway. Once I got past the initial lure of traveling to new places (including Guatemala, Taiwan, Australia, and Ethiopia), seeing new things, and doing different activities, the time spent traveling really became a deeper, personal experience; travel became introspective and a journey within to make discoveries about myself and my place in the world. Be a little nicer to others. When you travel, you make yourself vulnerable by leaving your comfort zone and putting yourself out in the world. You need help because you normally don’t know where you are, what to eat, and how to speak the local language. People are out there to help you, as long as you let them. You’ll see how people will open themselves up once you show some compassion and kindness. I once heard a 103-year-old woman answer the question, “What’s the best advice you can give to others on how to live their lives?” She simply replied, “Be a little nicer to others.” All those years of experience and wisdom and she understood that life at the core is made of all the interactions and connections, big and small, that we have with others. Be nice. Be extra nice. Bring out the best in yourself and others around you. You don’t need a ton of money to travel and you don’t need millions of dollars to be happy. If you’re always comparing your net worth to others’ net worth, you’ll never be happy. Happiness starts from within. If you’re pursuing things that you’re passionate about and give you purpose, you’ll be happier. When you help others for unselfish reasons, you’ll be happier. And when you connect with a purpose that’s bigger than you, you’ll truly be happy. I’ve met some of the happiest people in some of the poorest countries in the world and I’ve met some of the most depressed people in some of the richest countries in the world. Money doesn’t buy happiness. Living life on purpose will give you all the happiness you’ll ever need. Fulfilling work, quality time with your kids, “me” time, nutritious meals, regular exercise, eight hours of sleep every night, and meaningful travel are all the ingredients of a healthy life. You can have it all, as long as you make balance your goal. Sometimes you overwork yourself for weeks without end. You sleep less. You don’t go to the gym when you should. You eat junk foods and load up on coffee. Then you crash. Hard. And your body needs two full days to recover. You need balance every day all the time. Too much of anything isn’t healthy or sustainable. Balance is essential to healthy living. Your life is yours and yours alone. Be who you are. Follow your passions. Trust your gut. Don’t compare yourself with others. Stay true to what you believe. The key is to live. Many people are dying a slow death in a profession they are bored with; others are in destructive relationships; some are using escapes from actually living by abusing drugs, alcohol, TV, Internet, etc. You need to choose to live your life. That choice begins with trusting yourself and moving forward with your heart. Life is not a race, so enjoy the journey. Each step you take and each personal connection you make hopefully gets you closer to your truest, most authentic self. When you value the journey more than the destination, you are grateful for each step and blessing. You realize that failures exist not only as small lessons, but also as opportunities for mercies to come through. And you are present in every moment. When you let your heart lead the way, you’ll be on the path towards realizing your dreams. Sometimes what we want isn’t what the world says we should want, what our parents say we should want, or what our peers say we should want, but your path ultimately is the product of your choices. Stay the course. Listen to your heart. Let the love flow. Love the journey and you’ll be on your way.